Chapli Kebab recipe by Ghazala at DesiRecipes.com. 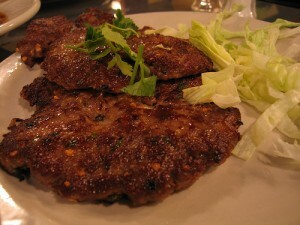 Chapli kebab is a patty made from beef mince, and is one of the popular barbecue meals in Pakistan. Combine all the spices and ingredients along with mince. Mix them well, make palm size cutlet. Then take 5 table spoon of oil, pour it on frying pan. Fry the kebabs on medium or low flame. Each side of kebab should be cook for 3 to 4 minutes. Serve the hot kebab with raita or green chutney. There are 29 comment(s) for this recipe. wow gr8 and yammy......I have tried and its tast really wonderful...Thanks for such lovely and easy recipe. yummmm..i tried these kabab and they were very well. this recipe was just ok.....i can make better Chapli Kebab . if any of us r guna try this then id adviz u nt 2 add tamatoes cuz it wud jst make the kebabs break n da end result wud leave u wiv oily kebabs. the rest of the kebabs r fyn tho!!!! Picture has been replaced. We apologize for any inconvenience. ewwwww im looking for recipes from making chapli kabob but this picture or it killed my appetite.